About a year ago a pure bred black lab wandered up to our house. He was a very friendly dog and we decided to take him in and see if we could find his owner. My 8 year old daughter was convinced that she had manifested this dog into our lives by wishing for him. Our last dog, a dalmation who had been in our family for over 10 years, had died about 6 months earlier. So around Christmas time she started wishing for a new dog. Who am I to doubt her...maybe her wish did come true. We posted signs and notified the shelters, but nobody claimed the dog and so "Buddy" became part of our family. 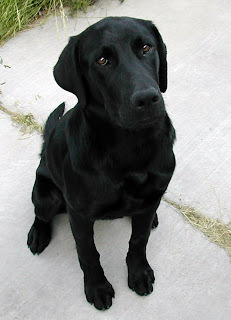 As a young black lab he has created his share of mischief. There have been times that I've wondered why I would ever take in a stray dog with all the other responsibilities on my plate. But my kids help out a lot by feeding him and playing with him. And except for the occasional chewed up sprinkler head or dug up landscaping, he has been a very good dog. Recently my daughter came into my office and handed me a piece of paper. She informed me that it was a list of all the things she loves about Buddy. The following is her list which she had numbered from 1-23! 1. He is big for a pup. 2. He likes to dance. 3. He loves to kiss. 4. He is a cute guy. 5. He keeps everyone company. 6. He likes belly rubs. 7. He has cute eyes. 8. He is crostrd foe bick (closter phobic). 9. He jumps a lot. 11. He wakes people up. 12. He has bad breath. 13. He wags his tail all the time. 14. He has the most cutest collar ever. 16. He can hear really well. 17. He keeps his tail up. 18. He's really good at rough housing. 19. He is really playful. 20. He has really good teeth. 22. He has a good nose.